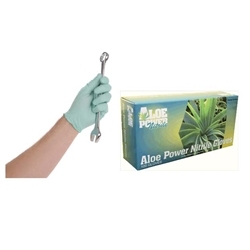 Aloe Power Medium Nitrile Gloves BOWES GL ALOE MED Box of 100. • Proprietary Freeze-Dried technology gradually bathes hands in aloe to help sooth dry, chapped, and cracked hands! • Available in both LATEX and NITRILE! • Textured Grip for unsurpassed grip control in both wet and dry working conditions.